Pegasus Golf & Sports Club is not just the newest face in town in terms of golf courses in New Zealand – it is literally a new town (of the same name), developing week by week. 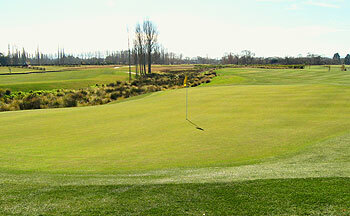 The golf course is the only significant layout to have been completed in New Zealand since The Hills in 2007, and opened on the 5th of December 2009. Within three months, Pegasus hosted its first national championship, the Pegasus New Zealand Women’s Open, which was won by England’s Laura Davies. Pegasus retained the event in 2011, which Australia’s Kristie Smith won. Pegasus also has a female architect, Kristine Kerr, who had previously worked with Gary Player before setting up her own company, Kura Golf Course Design. She was also earmarked to design the course for a new Christchurch Golf Resort, just 8 miles south of Pegasus, but this facility has not been constructed. The Pegasus course itself is set on relatively level ground, with the challenge being provided by lakes (in play on ten holes) and areas of natural wetland, surrounded by waterways and native grasses. Fairways are generous, and coupled with the wide range of teeing options (5,500 to over 7,000 yards), it is tailored for a wide range of abilities. Strategic thinking is emphasised throughout, with alternate routes to the green, and many putting surfaces angled to better receive an approach from a favoured side of the fairway. And most importantly, visitors to the South Island should note that the vast majority of Christchurch courses were open for business soon after the recent earthquakes and Pegasus itself escaped without any significant damage. Pegasus is the name of a new satellite city north of Christchurch in New Zealand. It is also the name of the golf course that was part of the master planning process. The full name of the course is Pegasus Golf & Sports Club, and it opened for play late in 2009. The course was designed by Kristine Kerr from Kura Designs, and has already hosted tournaments such as the Women's NZ Open to critical acclaim. Kerr is experienced in master planning for golf and residential communities and has created a good course from uninspiring land. The course is well bunkered throughout with generous fairways and good use of low-lying marshland and water hazards. The bunkering is a highlight of the design, and frames the wide fairways nicely. The green complexes are relatively simple but some pins positions will require thoughtful approaches from the right areas of those broad fairways to take advantage. Pegasus was designed very much with the average golfer in mind. The fairways are wide, and most will be able to keep their ball in play and play at a reasonable clip. However Kerr has done a good job of also making the game interesting for the better player, with pins more accessible from certain angles, rewarding the thinking golfer. It is also an attractive course, and just a nice place to play! I played this course in October 16 and really enjoyed the occasion. It was a course that I had been looking forward to playing for some time. I had played Terrace Downs a couple of days earlier and rate Pegusas the better of the two. Pegasus strength is the protection that the greens have and for this reason it is important to hit your drive in the right place on the generous fairways. Yes there are different options to be considered off some tees. There is plenty of variety of holes and the long par 5 18th is a killer at the end of the round especially if played into the wind and not to mention the near island two tier green which slopes towards the water!! I cannot fully comment on the course as I only got to play the back nine (and take a peak at a further three of the front nine). I was trying to squeeze in 36 holes at two different courses before 3pm, but a sharp morning frost put paid to that idea…. Anyway, it feels safe to assume that Pegasus seems squarely aimed at having a wide appeal, particularly seeking to please the casual golfer (i.e. it is not too difficult, and there is plenty of room if you are not attempting to break 75). And I think the architect has made a decent fist of that, if that was indeed her intention. The course has been billed as being from the strategic school, and I would agree that there are different ways to play many of the holes, depending on your handicap. I particularly liked the 15th and 16th holes, as both allowed a top player to be staring down a birdie from an aggressive well-hit drive, a more conservative par for the 10ish handicappers, and attainable bogey for those more accustomed to the good ol’ bogey train. The 15th is a highly original little number, a short to medium par 4 with two fairways that straddle some sunken wetlands. Crossing the fairway with your drive is definitely bold, and will leave an unencumbered wedge in. Play it safe off the tee, and you’ve still got those reeds to hurdle, with the green front sloping towards you, sucking those mis-hits back into the swamp. 16 is a par 5 that snakes back through those wetlands – again, a powerful (semi-blind) drive will leave the green there for the taking, but the water cuts across the fairway 20m short of the green, meaning that two pure hits will be essential. I don’t think it could be seen as a national Top 10 course, for three main reasons. One – the land’s too flat. Two – putting surfaces, and the surrounding green complexes, do not hold enough interest, and are without idiosyncrasy. Three – it is perhaps only strategic in the sense that it can be played by all different skill levels. Hazards look ominous, and will certainly often catch any wild play, but only occasionally force any dilemmas, and can usually be avoided by any half-decent golfer looking to play it safe. The 10th is a good example of this – water all the way down the left, but acres of room to the right hand side off the tee. Perhaps a bunker front-right of the green would create some decisions – there is one, but it’s 12-15m short of the putting surface. Left me feeling that the challenge was a little diluted, and I’ll happily aim for the right semi-rough off the tee next time.